Need a batch cocktail for your big game party? 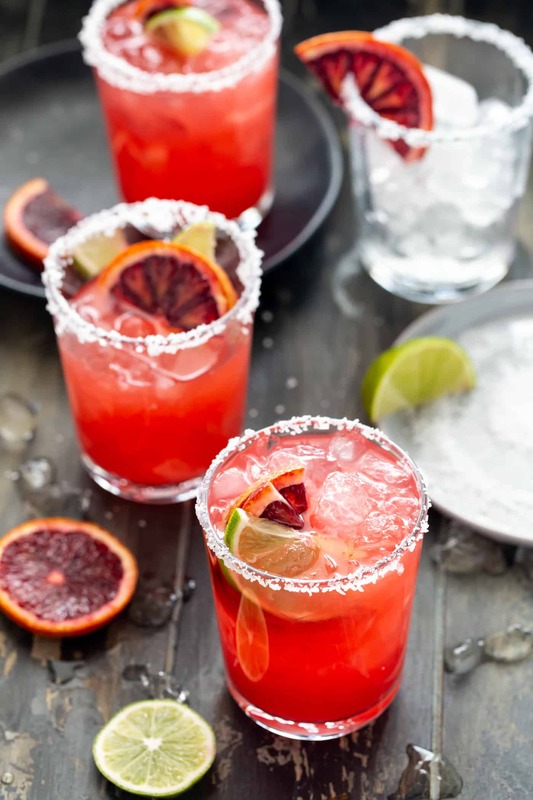 Look no further than these gorgeous Blood Orange Margaritas for a Crowd. 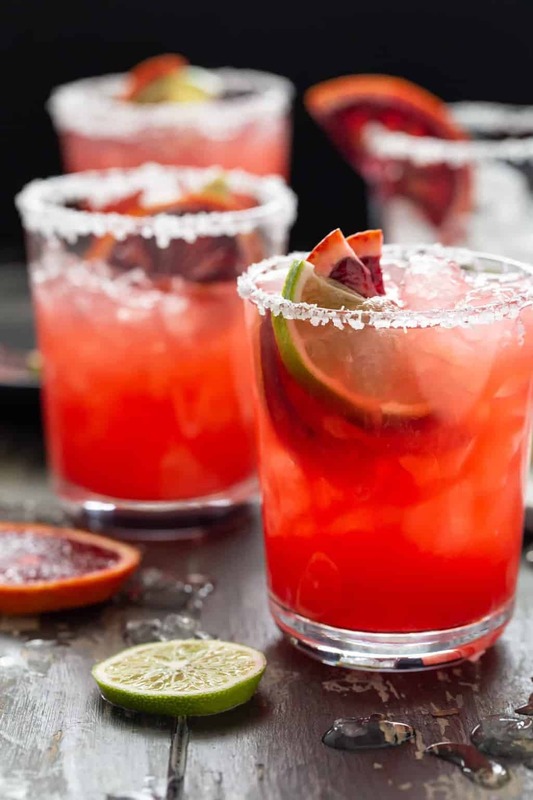 Even if you’re not a sports fan, you’ll want to throw a party just to make a pitcher of these irresistible Blood Orange Margaritas. The beautiful color and unique flavor of blood oranges brings a fun, seasonal twist to what is always a crowd-pleasing cocktail. Blood oranges have a similar taste to a navel orange with a hint of berry and a stunningly colored flesh. You might see them labeled as Moro oranges at the store right now. They are in season December through March, so grab them while you can! I can’t find blood oranges. Can I substitute another orange in this margarita recipe? I only make this margarita recipe when blood oranges are in season, so I haven’t tried substituting another variety. That said, Cara Cara oranges have a red flesh that would at least be similar in color to the striking appearance of the blood oranges. If you give it a try, we’d love to hear how it turns out! Tip: This recipe calls for four cups of blood orange juice and another cup of lime juice. Not into squeezing that much juice by hand? Give this juicer a try. It makes quick work of sizable amount of fresh juice. Plus the parts are dishwasher safe! 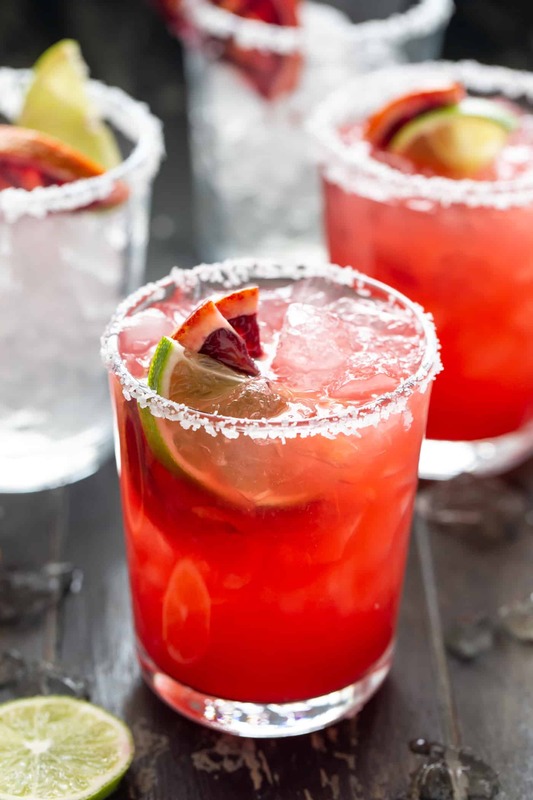 What kind of tequila do you use in this recipe for blood orange margaritas? I don’t like to muddy the gorgeous color of these beauties, so I always opt for silver or blanco tequila. It’s a young tequila that is not aged, which also makes it less expensive than a reposado or anejo tequila. Perfect for mixed drinks! Can I make just one blood orange margarita instead of a batch of them? Sure! This recipe is written for a pitcher full of cocktails, but feel free to scale the recipe for yourself. Simply divide the ingredients by however many servings you need (no judgment here!). Searching for a seasonal cocktail to banish the winter blahs? 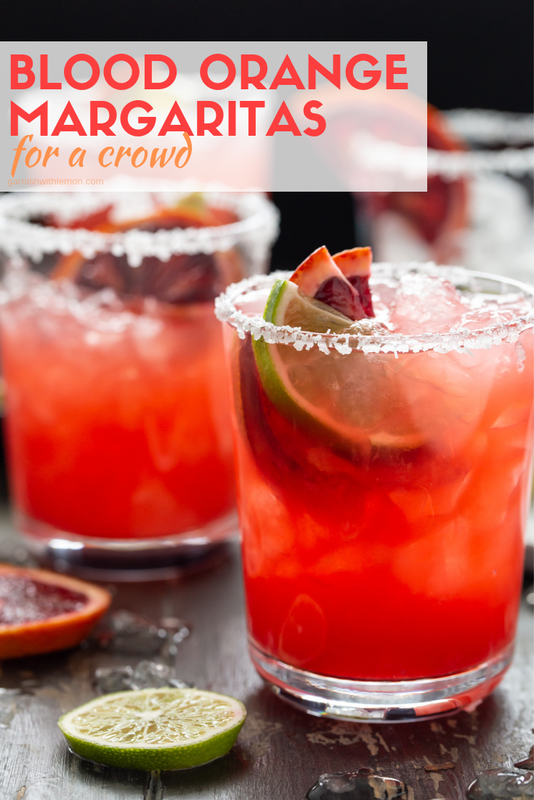 Look no further than these eye-catching Blood Orange Margaritas for a Crowd! Place juices, tequila, triple sec and sugar in a large pitcher. Stir until sugar is dissolved and refrigerate for at least 2 hours. Rim edges of glass with lime wedge and salt. 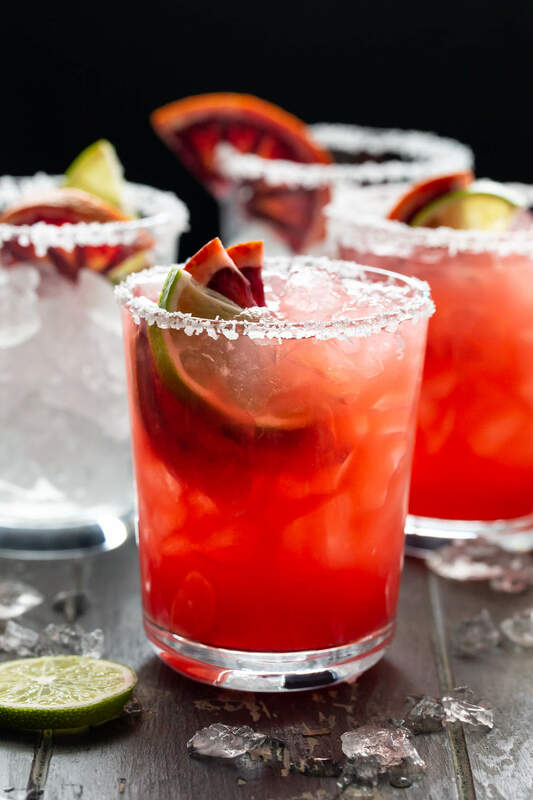 Divide margaritas among ice-filled glasses and garnish with blood orange slices, if desired. A Margarita Monday sounds like a solid idea to me! Cheers! Totally making these! Love the color! Me, too, Ashley. The color is irresistible, especially during this dreary time of year. These margs are stunning ladies! Cheers! Thanks, Lauren. These babies are totally toast-worthy! Thanks, Alice. I love the color, too! I enjoyed the video on FB and had to come see the recipe. So perfect for a party. Fun drink! So glad you saw the video, Diane! It’s a great recipe for a group. Beautiful pictures – I can’t wait to try these! So beautiful, these would be a hit at any party! Big fan of this flavor combination – great winter drink! Hi! This looks awesome! I’m wanting to do it tomorrow for my son’s first birthday party, but since blood oranges are out of season I can’t find the juice or orange anywhere. What are your thoughts on using clementine, tangerine, or cara cara (red navel orange) juice instead? Just wondering how much it would alter the taste and which one would be best to go with. Thank you! Hi Betsy, I would suggest going with Cara Cara oranges. They seem to be the closest in flavor profile (sweet-tart) to blood oranges. Enjoy the party! Thank you, I’ll let you know how it turns out! You are speaking my love language with these margaritas. Beautiful! And thank you so much for featuring my Prosecco margaritas recipe. Cheers, friends!